The Amazon Echo has had calling and messaging capabilities for a while now, but you can finally send text messages from your phone via your Echo using Alexa. In the past, you could only send messages to other Alexa users (or you call any phone number). But now you can send text messages to anyone using your voice, and it’ll show up on their end as a regular text message sent from your phone number. The only downside is that it’s Android only right now, and it’s only available in the US. Also, it will include a link to an audio version of your spoken message—there’s currently no way to turn this feature off. Also keep in mind that text-to-911, group messages, and MMS messages are not supported. 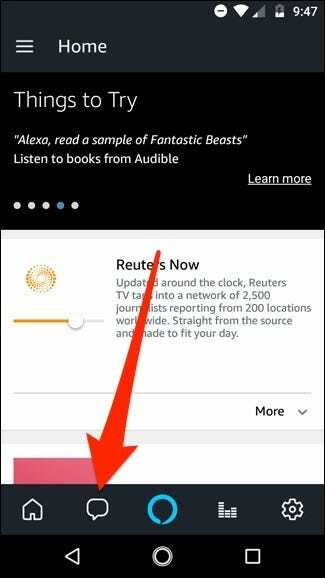 To get started, make sure the Alexa app is updated to the latest version. Then open up it up and tap on the Conversations tab at the bottom of the screen. You’ll get a pop-up introducing the new SMS messaging feature. Tap on “Go to My Profile”. Scroll down and tap on the toggle switch next to “Send SMS” to enable the feature. Hit “OK” when the confirmation appears. 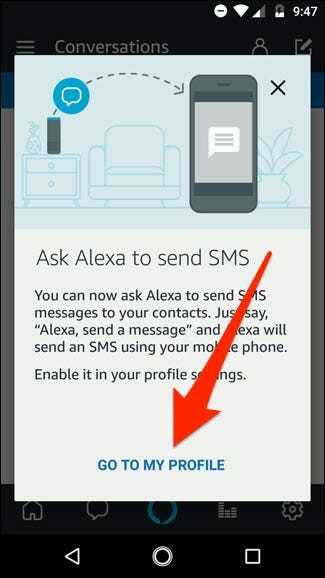 Next, you’ll get a pop-up asking Alexa for permission to send SMS messages, hit “Allow”. 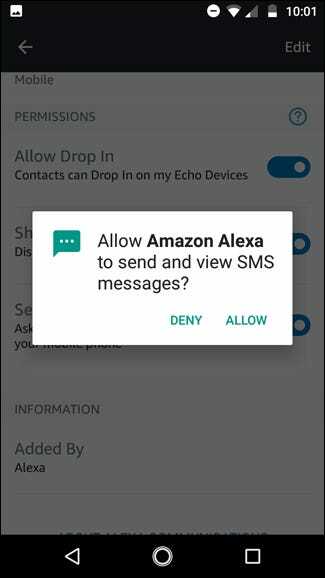 You may also receive another pop-up asking Alexa to access your phone’s contacts, if you’ve never received that prompt in the past. You can deny this, but it’ll be a bit more cumbersome to send a text message using your Echo, since you’ll need to say the ten-digit number instead of just the contact’s name (more on this further below). 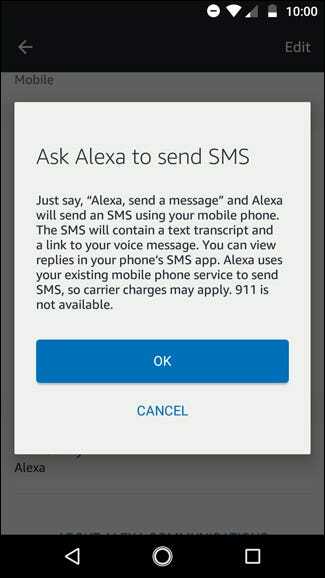 Once you’ve at least allowed Alexa permission to send SMS messages from your phone, though, you’re all set! 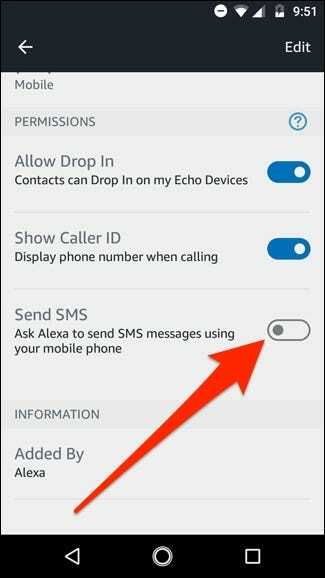 Once you have SMS messages enabled in your Alexa account, you can begin sending text messages from any of your Echo devices. To do this, simply say “Alexa, send a message to Dave”. Or if you want to send a text message to someone who’s not in your contacts (or just haven’t given Alexa access to your contacts), you’ll need to say “Alexa, send a message to 123-456-7890” and spell out the whole ten-digit number. After that, Alexa will ask you what you want to say and then it will send the text message. When the recipient receives the text message, they’ll get a text version of what you said, along with a link to the voice-recorded version. Unfortunately, Alexa won’t alert you when you get a reply nor will she read back the reply to you. So you’ll still need to rely on your phone when receiving text message alerts and reading replies. If anything, this feature is more about having a convenient option to text someone if you left your phone upstairs, rather than becoming a replacement for your phone.